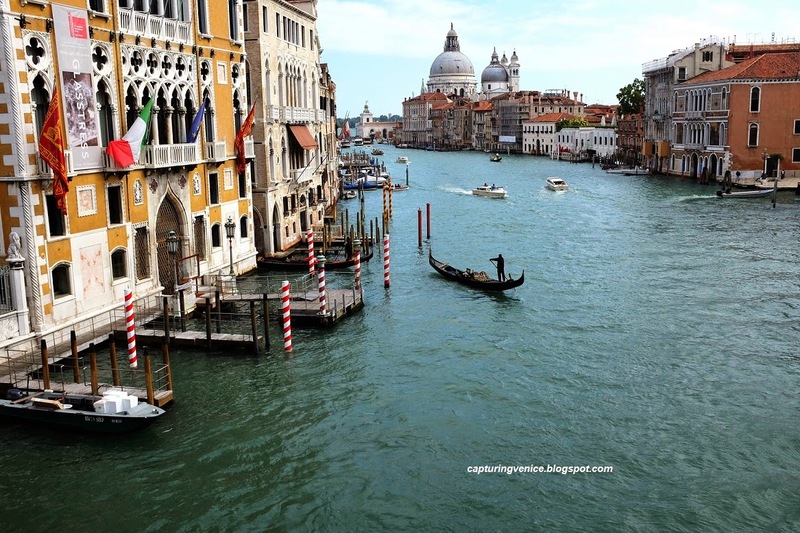 I stood on the summit of the Accademia bridge, and drank in that iconic view of the Grand Canal, sweeping down towards the serene, welcoming beauty of the Salute. The sun was shining, and I listened to the chatter of other tourists sweeping up and down the broad steps of the bridge, stopping to admire, and photograph and smile. I lazily scanned the traffic passing beneath the bridge and in the distance, I enjoyed watching the skill of the gondolier as he gracefully steered his elegant little black vessel across the canal. A gondola reminds me of a bumble bee, of which someone said "It shouldn't be able to fly.". With the gondola, it's hard to believe something so heavy can be so graceful on the water. Aren't the gondoliers amazing? With a flick of their wrist, a change of the position of the oar in the forcola, a foot to nudge them off a wall,they guide their craft through crowded canals. Yep, I totally agree with you, Yvonne - I find the skills of the gondoliers endlessly fascinating to watch.